Steve Gizinski is responsible for leading the divisions operations, strategy and planning. He brings to this role more than 20 years of in-depth expertise in overseeing mission-critical technology efforts for commercial, federal, intelligence and homeland security customers. Prior to joining Integral Systems, he served in management positions at Northrop Grumman and Boeing. At the latter, he founded and led Boeings Satellite Applications Center in Herndon, Virgina, where the principal focus was on implementing and maintaining regional and global communications solutions based on satellite and terrestrial technologies. Mr. Gizinski holds a BS in Electrical Engineering from the University of Central Florida and a MS in Systems Management from the University of Southern California. Good day, Mr. Gizinski. Would you describe your responsibilities at Integral Systems to our readers? I am the General Manager for Integral Systems SATCOM Solutions division. In this role I am responsible for the oversight and management of the development and manufacturing of a range of SATCOM terminals, RF products, High Speed Modems, Access Gateways, and Satellite Ground Systems equipment, as well as a Professional Services Division. Our Division is comprised of approximately 100 highly-technical, innovative and creative people who work closely as a team. My most important job though, is to work closely with our military, commercial and civil government customers to ensure we are providing them with products, systems and solutions that meet their most complex challenges. What product lines does the SATCOM Solutions Division manage and develop? SATCOM Solutions has products targeted for users end-to-end along the data transmission chain from teleports and network operations centers to those in the field. For network and ground systems operators, we offer High Data Rate Modems (HDRMs), multiplexers and telemetry processors. For field users, we have a variety of maritime and terrestrial USAT/VSAT systems and flyaway communications kits. In the VSAT area, our Raptor manpackable, airline carry-on size deployable communications line of 45 cm and 60 cm X, Ku-, and Ka-band kits are used by the military to make it easier to communicate in the field. Also, a recent acquisition has allowed us to move into the RF products arena. Our new Solid State Power Amplifiers (SSPAs) and Block Upconverters (BUCs) are a major leap forward in terms of size, weight and power efficiency. In addition, our new line of SSPAs are the ideal choice for customers looking to replace, or retrofit, Traveling Wave Tube Amplifiers (TWTAs) nearing the end of operating life. I am excited to have an opportunity to lead a group of tremendously talented and motivated technologists. The ability of our team to create innovative products that address market needs is impressive. As a General Manager, there is no better feeling than to have this sort of talent as part of your team and, because of their professionalism and dedication, the satisfaction I get when customers call me to praise our team and technology. Why did you select the satellite industry as your chosen career field? As far back as six-years old, I was enthralled with the idea of rocketry and space travel. As a matter of fact, I still have a Crayola drawing of an Apollo splashdown in a trunk in my basement that I drew while in kindergarten. As time progressed, maybe around the sixth grade, I realized I wanted a career in the space business and determined that I was going to work towards being an engineer. The opportunity to work on advanced technology in such a unique environment was exciting to me. I received my engineering degree and started my professional career building launching satellites for the Hughes Aircraft Company and all Space Shuttle launches. I also spent time at Martin Marietta (now Lockheed Martin) working the launch side on the Commercial Titan program. For the past 15 years, I have been focused on the ground segment of space communications. I really enjoy that I have had a chance to work on various phases of satellite communications and truly love what I am able to do for a living! Are you concerned over the lack of interest in technical training of our younger students as they engage in their educational pursuits? How can the industry further the cause of STEM training to ensure a competent work force in the future? The critical need is to get todays students excited about space and the SATCOM industry. Integral Systems is committed to helping through our support of programs like the CanSat Competition where more than 20 university teams build, test, launch and operate can-sized satellites. While it is setup to be a fun, educational activity, the competition is structured to be as similar to a real-world satellite program as possible with a full slate of industry-standard reviews, such as PDR, CDR and pre- and post-flight reviews. We are also active with the AIAA educational activities, including STEM, through involvement with the AIAA Space Operations and Support Technical Committee (SOSTC) Education Subcommittee. A career in the space and SATCOM industry is exciting and incredibly rewarding, especially as the country and the world increasingly relies on space for global communications. Integral Systems will continue to do its part to foster enthusiasm in STEM programs, and we look forward to working with our partners in the industry on this critical initiative. You have a great deal on your plate that involves technological oversight for military/government and commercial sectors. Where do you see SATCOM heading over the next year or two, especially as such applies to your Company? We see end-user SATCOM technology in general heading in the direction of a more commercial-based approach, a reduction in the size, weight, and power of components (as we have implemented in our SSPA product line) and from the government, an ever growing emphasis on multiple award orders that are based off of ID/IQ procurements so that industry competes for lowest price technically acceptable and best value solutions. One of the areas of concern within MILSATCOM and SATCOM is the quest for capacity... how is Integral assisting in developing technologies to ease the flow of information? The latest maritime terminals that we supply to both the United States Navy and Coast Guard have served to upgrade the capacity of their communications nodes within a worldwide network. These Ku-band terminals also have optional bands that can be added on the same physical platform to further increase capacity by combining multiple bands for multiple uses on the same hardware footprint. Is the melding of terrestrial and satellite technologies becoming more efficient? How do you answer those who are concerned about comms security, especially for boots on ground and the command operations? Terrestrial and satellite both continue to benefit from technological advancements in circuit design, capacity and size, weight and power (SWAP) improvements. Both segments benefit from industry advances. Comms security and the assurance of information across deployed systems continues to have the highest priority. Communications systems need to be capable, flexible and secure to meet the needs of the warfighter. Like many in the industry Integral Systems tests its solutions to ensure compliance for security in a package that is designed for high MTBF for the critical boots on the ground personnel. The Company has a new and smaller SSPA offering  can you generally discuss some of the other new products that are in your development pipeline? Our Raptor line of terminals continues to evolve. Using the initial 45 cm units as a baseline, we are working on a 60 cm terminal that will offer increased performance, including the option for autopointing. Upcoming Raptors will also benefit from our new SSPA and BUC technology, which will help keep the system weight down and increase efficiency. Another area we are working on is an evolution of our existing HDRM. The new product will be a software defined radio that supports two-way data rates from 50 kbps to 900 Mbps. Waveforms supported include DVBS2 at up to 300 MSymbols/S and all ground and air Standard Common Data Link (CDL) waveforms and rates (200 kbps to 274 Mbps). It will also support Direct Sequence Spread Spectrum (DSSS) technology, and will be configurable to accommodate multiple modulation schemes, data rates, coding algorithms and data formats. Being responsible for military/government and commercial product lines must be challenging  could you explain the differences in approaching clients within both fields of endeavor and how you handle contract issues within each category? Both military/government and commercial users expect a high quality product that is a best value solution for the application. This expectation is not exclusive to either group and, as such, allows us to standardize on a common set of processes and procedures to efficiently run our ISO-9001 certified company. We find that a customer-centric approach that emphasizes on time, on budget, requirements to compliant solutions serves both of these communities and the unique products and services that are required. Additionally, working with both communities allows us to develop and maintain a best practices environment that draws from the best that both of these worlds offer. There is enormous interest in airborne and maritime antenna systems  as well as a great deal of competition. How do you present Integral Systems products to offset competitor challenges? The competition is definitely intense. Generally we try to leverage the breadth of knowledge within our engineering staff to produce innovate and affordable solutions, as well as our experience in production. SATCOM Solutions has implemented a consistent repeatable systems engineering approach to produce our products and services. We approach each customer and each contract using this set of systems engineering principals to consistently perform from the development of the solution through to the implementation, testing and O&M stages. Combining this approach with systematic trade analyses during the design phase regularly results in the best value solution to the government and commercial marketplace. Our customers are the benefactors of this strict adherence to process, and as a result are inclined to give us repeat business. A recent example of this philosophy has been implemented on our SDM-M contract where we have delivered 935 baseband kits since 2006  every one on, or ahead of schedule, and requirements compliant and within budget. 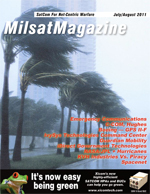 Security concerns for MILSATCOM and SATCOM continue to garner a great deal of attention  what is Integral Systems undertaking to assuage such concerns? Both cyber and physical security of our networks, our facilities and our system deployments are always of the utmost importance and priority. We regularly work with fully accredited independent third parties to review and assess our networks, validate and certify our equipment and test and implement our products in the field. We regularly implement recommendations from the consistent feedback of our government and commercial customers. Each deployed solution is on a spiral path to address security risks and threats, update hardware and software to assuage these threats and regularly reviewed to assess and mitigate new threats as they arise. With the increasing use of FMV in the field of military operations, does Integral have any plans to implement new technologies to assist with real-time delivery via compression to assist warfighters and NGO projects? We have several innovative products that support delivery of full motion video. In the SATCOM arena, our HDRM provides support for the Digital Video Broadcast  Satellite  Second Generation (DVB S2) at the industrys fastest data rates  900Mbps. The tremendous benefits of DVB-S2 are highly relevant to many areas including UAV operations. This waveform is a leading contender for use with programs such as HDR-AT. On the ground network side, our ioPLEX provides for the adaptation of FMV over an Ethernet or ATM network using JPEG-2000 CODEC to perform compression of live video streams. This approach has a unique advantage in that it is robust over error prone networks. This approach essentially eliminates the negative effect of Ethernet frame loss that is seen when using MPEG encoding.